Custom front rigging. Tell us what you need! 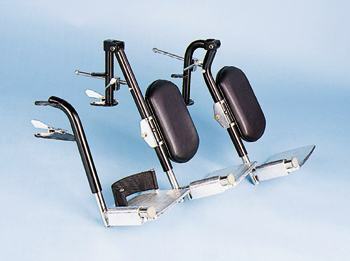 Desk length self-supporting adjustable arms (flip up, no arm panels). 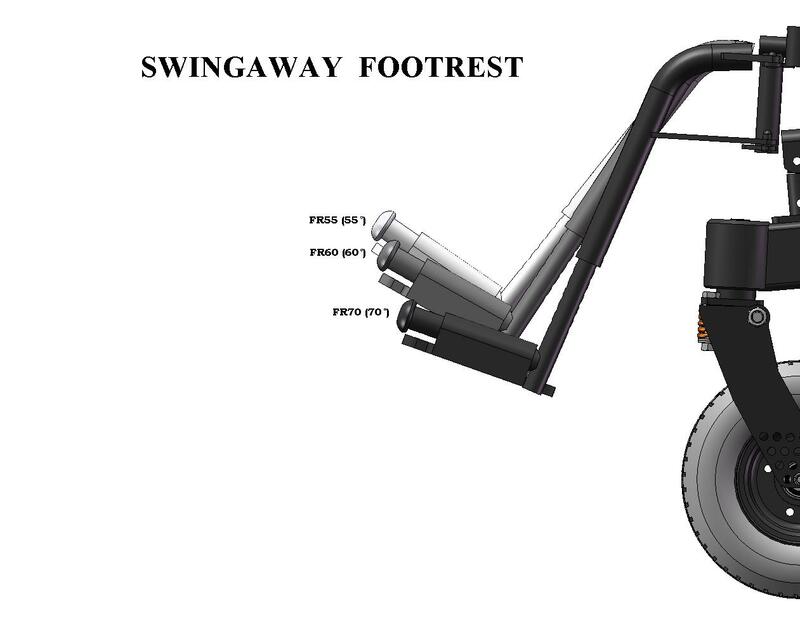 Includes clamp on backpost mount with anti-rotation rib. 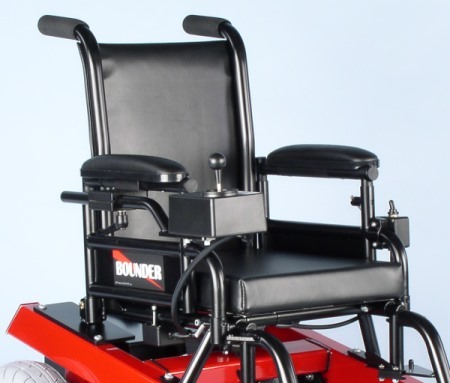 For non-reclining back chairs. Very strong! 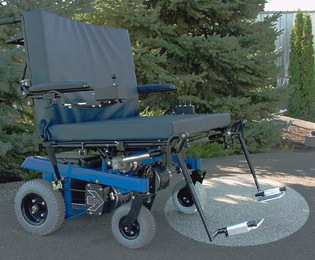 Full length self-supporting adjustable arms (flip up, no arm panels). 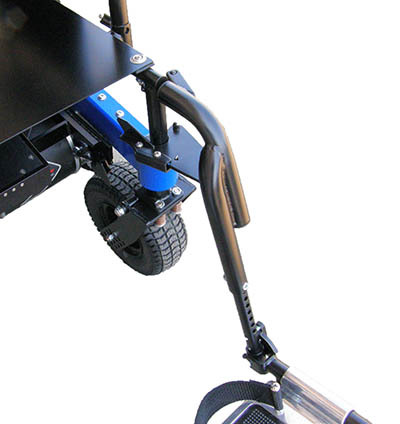 Includes clamp on backpost mount with anti-rotation rib. 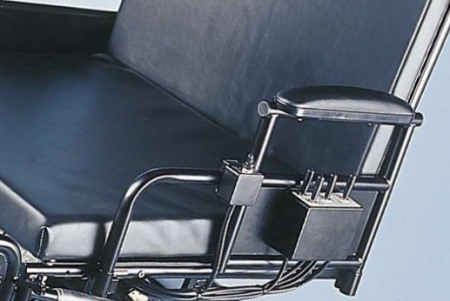 For non-reclining back chairs. Very strong! Desk length self-supporting cable style arms (flip up, no arm panels). 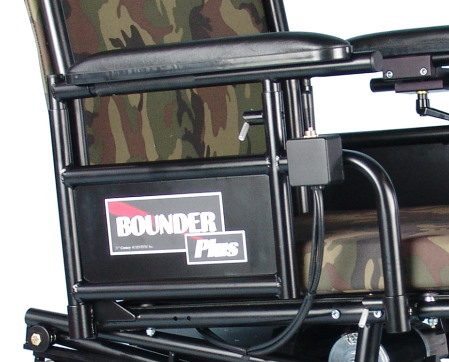 Primarily used Big Bounder chairs with reclining backs. 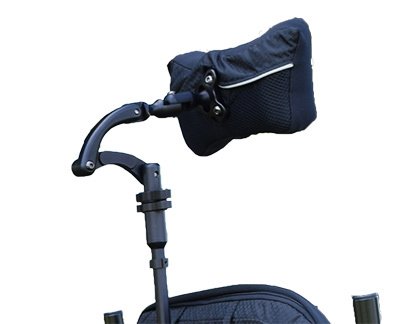 Allows body tissue to extend under arm. 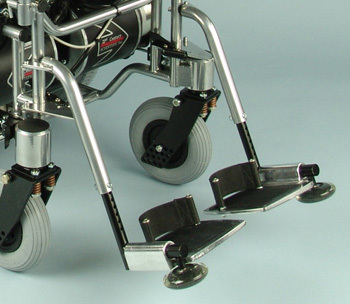 Full length self-supporting cable style arms (flip up, no arm panels). 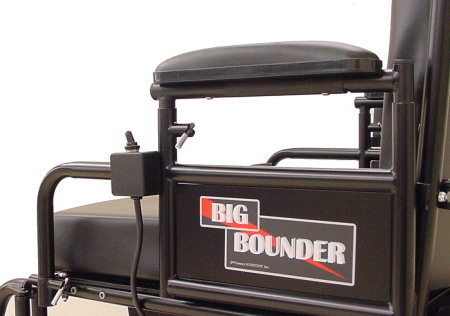 Primarily used Big Bounder chairs with reclining backs. Allows body tissue to extend under arm. 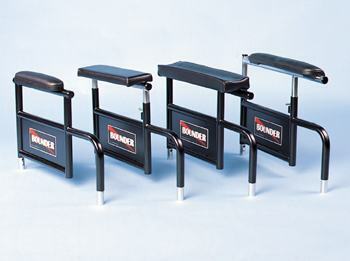 Upholstery modesty arm panels for use with SS ADJ ARMS. 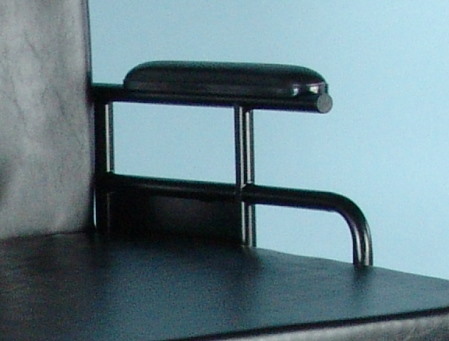 Covers side of chair providing greater privacy for the user. Pediatric arms (lower arm assembly is 3" lower). For adults of small statures as well as children. Custom arms. Tell us what you need! 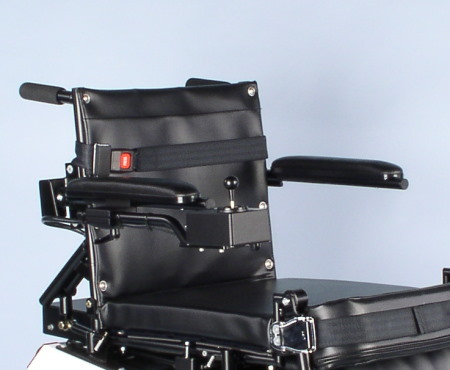 Standard upholstered black plastic base armrest pads - Naugahyde only. Available in desk or full length. 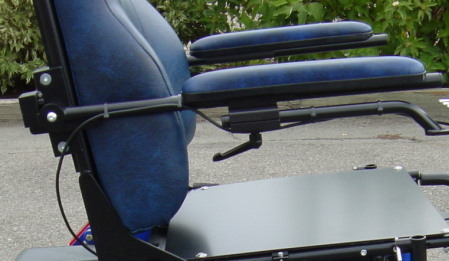 Install waterfall armrest pads instead of standard armrest pads, Naugahyde only. Available in desk or full length. 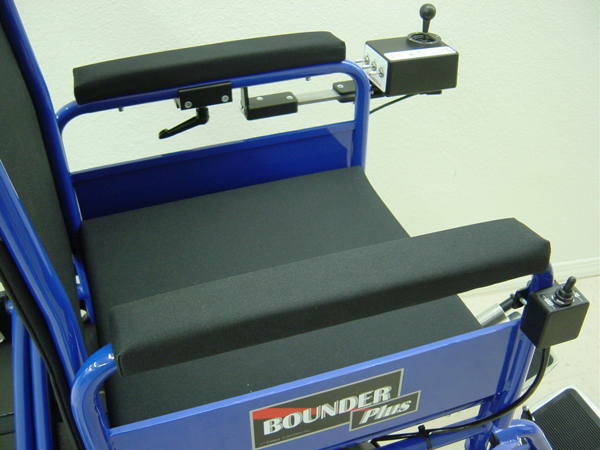 Install 3.5" wide trough armrest pads instead of standard armrest pads - Naugahyde or fabric. Available in desk, full or custom lengths. 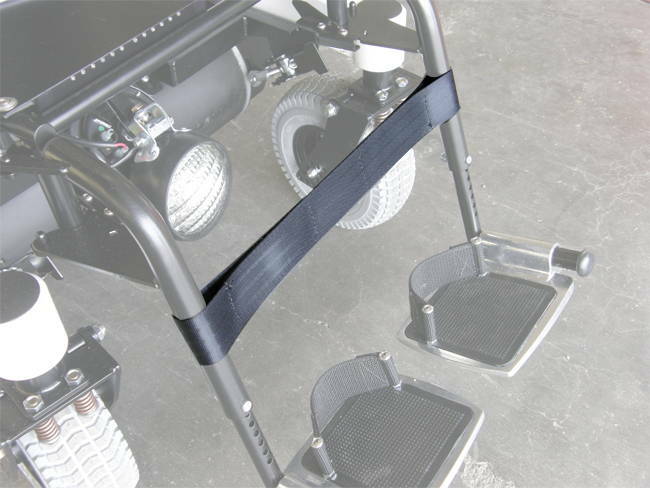 Install 3 1/2" wide flat armrest pads instead of standard pads - Naugahyde or fabric. Available in desk, full or custom lengths. 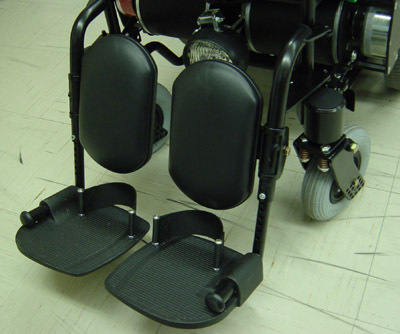 Install narrow 2" wide flat armrest pads instead of standard pads - Naugahyde or fabric. Available in desk, full or custom lengths. 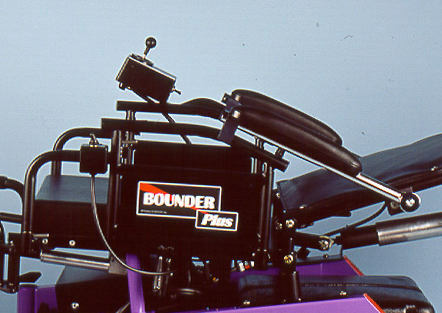 Install custom armrest pads instead of standard armrest pads. Tell us what you need!